Speck Balance Folio Case Cover for the Apple iPad Pro 11" (2018) New Authentic! Protect your most important electronic with this Speck Balance Folio Tablet Case for iPad Mini 4. Protective interior liner with 4-foot drop protection. Trending at $7.18eBay determines this price through a machine learned model of the product's sale prices within the last 90 days. 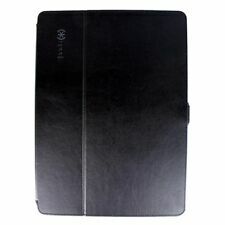 Speck Balance Folio Case for Samsung Galaxy Tab S4 10.5" (2018) - NEW !!! Speck Balance Folio Case For iPad 9.7" (2017), iPad Pro 9.7" and iPad Air 2. Will fit NEW iPad 9.7" (2017 / 2018 version). Color: Purple. Trending at $15.49eBay determines this price through a machine learned model of the product's sale prices within the last 90 days. Trending at $15.22eBay determines this price through a machine learned model of the product's sale prices within the last 90 days. The Speck Balance Folio Case for the Apple iPad 9.7in (2017/2018) Pro, Air, and Air 2 models. The colors are also known as Plumberry Purple, Crushed Purple, and Crepe Pink. Apple iPhone XS Max. Apple iPhone XS. on sale ! 100% Auth Speck Products ! only few left ! Speck Balance Folio Metallic Slim Protection Folio Case for iPad Pro 10.5"
Trending at $9.16eBay determines this price through a machine learned model of the product's sale prices within the last 90 days. Speck Balance Folio Case w/ Stand Auto Wake/Sleep for Asus Zenpad Z8s - NEW !!! 5 out of 5 stars - Speck Balance Folio Case w/ Stand Auto Wake/Sleep for Asus Zenpad Z8s - NEW !!! 2 product ratings2 product ratings - Speck Balance Folio Case w/ Stand Auto Wake/Sleep for Asus Zenpad Z8s - NEW !!! 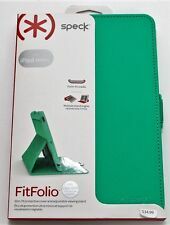 Original Speck Balance Folio Case For iPad 10.5". Color: Purple. Adjustable stand. Recessed, magnetic cover. Cover fits seamlessly into case for a slim design. Magnets wake or lock your screen when you open or close the cover. 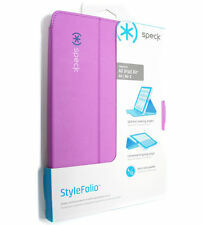 Speck Burton Fitfolio Case for Apple iPad 2/3/4 Generations SPK-A1788. Burton Graphics. Fabric-backed FitFolio hard case by Speck, wrapped in custom style. - Optimal viewing angle. High Quality Speck case. iPad Air, 5th Generation. Part Number: SPK-A2249. All of our products are 100% Original! – NO FAKES! Speck Balance Folio Case for Samsung Galaxy Tab A 8.0 (2018) - NEW !!! SPECK Balance Folio Slim Protective Case for Apple iPad Pro 10.5"- NEW !!! 3.5 out of 5 stars - SPECK Balance Folio Slim Protective Case for Apple iPad Pro 10.5"- NEW !!! 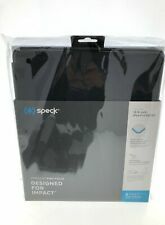 2 product ratings2 product ratings - SPECK Balance Folio Slim Protective Case for Apple iPad Pro 10.5"- NEW !!! 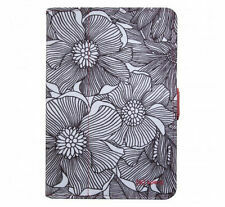 Speck CandyShell Shell Cover Case For iPad 1st Gen. Item is in black/pink color! Flip-back panel for use with iPad dock and iPad keyboard dock (not included). We distribute iPod & iPhone accessories worldwide. Authentic Speck Products, The Balance Folio Series. Magnetic cover fits seamlessly into case for a slim design. Magnets wake or lock your screen when you open or close the cover. iPhone 8 Cases. 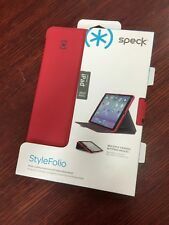 Speck FitFolio Case for Apple iPad mini 1 2 3. Function that liberates Multiple viewing angles make this one of the best iPad mini cases because you can always find the perfect angle. A secure closure clasp holds your cover either folded or shut for when you’re on-the-go. Color:FreshBloom Coral Pink. Speck style and sleek looks! Custom-fit hard shell cradle holds your iPad Mini in place. 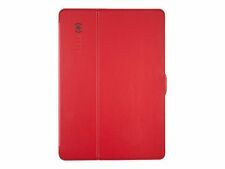 Slim-fit protective cover and adjustable viewing stand for iPad Mini. Secure plastic snap closure. Adjustable stand. Protective interior liner. Soft liner protects your iPad 9.7 against scratches. The adjustable stand allows you to choose from multiple angles for the most comfortable viewing and typing positions. Check-Out Later?. Software that has been opened will NOT be accepted. Check-Out Now! Speck StyleFolio Cover case for iPad mini 4. Speck style and sleek looks! Color:Malachite Green. Custom-fit hard shell cradle holds your iPad Mini in place. 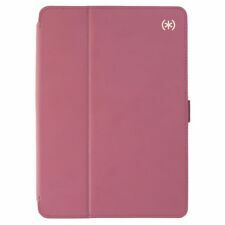 Slim-fit protective cover and adjustable viewing stand for iPad Mini. Secure plastic snap closure. You are considering buying a like new open box item. Vegan leather cover with seamless design. Vivid colors and high-resolution patterns garnish StyleFolio's easy-to-clean vegan leather cover, making your Galaxy Tab 4 look better than ever with a seamless, impeccable design. Speck Balance FOLIO case designed to be compatible with the Samsung Galaxy Tab E (8.0). Folio case design with a black finish. - Compatible with the Samsung Galaxy Tab E (8.0). - Full interior liner protection. Authentic SPECK Balance Folio Case Cover w/ Stand for Asus Zenpad Z8s - NEW !!! Vegan leather cover with seamless design. Vivid colors and high-resolution patterns garnish StyleFolio's easy-to-clean vegan leather cover, making your Galaxy Tab S look better than ever with a seamless, impeccable design. Speck iPad/ Pro 9.7"- iPad Air / Air 2 - Balance Folio Case for BLACK OEM NEW. Condition is New. Shipped with USPS First Class Package. Speck ipad pro 11 clear folio folding case. Condition is Used. Shipped with USPS First Class Package. Case is used but in very good condition. This case fits the latest 11 inch ipad pro. This case does not support apple pencil 2 charging and you have to remove the case if you want to charge it. Message if you have any questions. Speck's StyleFolio's sleek design and tough construction protects your iPad Mini 4 with it's hard shell and anti–scratch liner. Hard Shell and Anti–scratch Liner. Speck style and sleek looks! Custom-fit hard shell cradle holds your iPad Mini in place. Color:Raspberry Pink. Slim-fit protective cover and adjustable viewing stand for iPad Mini. Secure plastic snap closure.